A specific, nine-digit number that is assigned to each banking institution and is used to identify the bank and direct ACH debits and credits. The ABA routing number is usually found at the bottom of a personal or business check. Automated Clearing House – A group of processing institutions that are linked by a computer network in order to process electronic payment transactions between financial institutions. An electronic debit that is created from a consumer check processed in a lockbox, dropbox or other receivable processing field. A financial institution that is connected to Visa® and/or MasterCard® and maintains the merchant credit card processing relationship. The acquirer receives all transactions to be distributed to the issuing banks from the merchant. A service designed to help combat fraud in non-face-to-face transactions by verifying the cardholder’s billing address against the one on file with the issuer. It is supported by Visa, MasterCard, Discover and American Express®. API’s allow users to program on a pre-constructed interface rather than individually programming a device or piece of software. The Trade Association of American Bankers which has the authority to assign identification numbers. A company specializing in the issuance of Travel and Entertainment (T&E) cards. American Express serves as its own transaction processor with its own processing network, thus able to service the cards it issues. A provider that hosts software applications on its own servers. Customers can access the application through private lines or the Internet. Also known as a “commercial service provider” (CSP). An affirmative response after a transaction authorization request. A procedure done by an acquirer on behalf of the merchant in order to resolve a chargeback-related dispute with a card issuer. Licensing regulatory agencies for bank card activities. These are MasterCard International, Visa U.S.A. or Visa International. A computer terminal that carries out basic teller functions when a cardholder inserts their card into the ATM and enters their unique PIN. Functions include dispensing cash, accepting deposits and loan payments, as well as account transfers and balance inquiries. Credit cardholders may also use it for receiving cash advances. The method by which a transaction is approved by the issuer or by Visa/MasterCard on behalf of the issuer. Permission is granted or declined to the merchant, through the acquirer, to accept a specific transaction from the cardholder account. The authorization indicates that the card is valid and that sufficient funds are available at the time of the request. A numerical code assigned to a sales transaction by the issuer as verification that the sale is authorized. Used to hold a dollar amount against a credit card’s available credit limit for an intended purchase. Authorization Only is mostly used in industries such as lodging, restaurants and car rentals, where an approval is received for an approximate amount prior to the finalization of the charge amount. A merchants request to accept a cardholders sales transaction. Authorization requests can be made electronically, via credit card processing terminal, or by telephone voice authorization. A process by which information is automatically sent in order to resolve a chargeback on a merchant’s behalf, without the need merchant involvement. The average dollar amount of a sale made through credit card transactions. 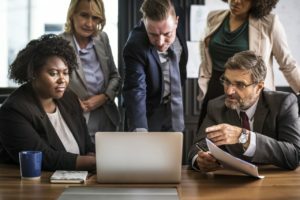 Business to Business – Where one business is communicating with or selling to another. This is the settlement provider that is in charge of finalizing transactions, routing payment to a merchant’s account and generating statements. A specific sequence of numbers assigned by Visa/MasterCard to a member institution. The numbers identify each institution in transaction processing. The BIN is made up of the first six digits of a standard credit card number. A MasterCard or Visa brand card that is issued by a banking institution. A collection of approved credit card transactions accumulated over a certain period of time. This time period is usually one business day. An electronic deposit of a batch, which is transmitted to the transaction processor for settlement. The offline authorization of transactions when immediate approval is not necessary. Transactions are compiled in a batch and sent as one transmission for authorization and/or settlement. This is most commonly used with mail order/telephone order (MOTO) transactions. A payment card issued to, and used by small business owners. Collection and storage of transaction data at the processor’s host computer, later submitted for processing and payment. An American Express and Discover verification method where a printed, non-embossed three or four-digit number is used to authorize a credit card transaction when the physical card is not present. A credit card transaction where the physical card is not present at point-of-sale in order for the magnetic stripe to be read. These transactions are considered higher risk. A type of transaction in which the card is present and is swiped through an electronic device that reads the contents of the magnetic stripe on the back of the card. A card terminals input device that translates information stored on a card’s magnetic stripe. The person to whom a payment card is issued, or an additional authorized card user that is designated by the original cardholder. An arrangement of numbers assigned specifically to a cardholder’s account. It also identifies the issuer and type of payment card. The account number is always the embossed number printed on the front of the payment card. A chargeback that occurs when a cardholder contacts the card issuer to decline a charge appearing on their monthly billing statement. The cardholder has 90 days from the time of sale to initiate a chargeback. A transaction where a cardholder obtains cash in hand at the branch or ATM of a member financial institution. This is the only approved method of receiving cash from a credit card. A credit or debit entry started by a merchant in order to consolidate funds from its organization, branches, franchises or agents, or other organizations; Or to fund the accounts of its branches, franchises or agents, or another organization. An objection to a transaction initiated by the issuer or cardholder, which is returned to the acquirer for resolution. The amount determined by the acquirer for processing chargebacks. A numerical code identifying the reason for the chargeback. MasterCard and Visa each have their own distinct chargeback codes. A bank card that is used with a PIN when used at an ATM or without a PIN at the point of sale. It is also known as an offline debit card. When used without a PIN at the point of sale, the card is processed as a credit card transaction where the funds are debited from the cardholder’s checking account. A service guaranteeing check payment to a merchant. Guarantees are up to a specified amount and merchants are required to perform correct authorization procedures. A device that reads the encrypted numbers on the bottom of most checks. A service providing merchants with some defense against bad checks. The person writing the check is matched against a national negative file database in order to flag outstanding or bad checks on record from other members of this service. An authorization process used to determine if a transaction is valid. When a POS device displays “Lost or Stolen Card,” “Pick Up Card” or a similar message, the merchant calls the authorization center for a Code 10 Authorization where the operator will ask questions to have the transaction verified. An organization hosting commerce software applications on its own servers and within its own facilities. Corporate Card – Generally issued to the employees of a large corporation that assumes all liability for the card’s usage. Purchasing Card – Issued to a corporation, this card allows numerous parameters to control daily and monthly spending limits, total credit limits and where the card is to be used. Several employees may be issued the same card number. Business Card – Similar to the Corporate Card, but issued to businesses with fewer employees. Each employee is responsible for their own purchases. Agreement to the Visa and MasterCard regulatory bylaws. Also, a method of resolving a members dispute if no chargeback reason code applies. The challenging member must be able to demonstrate financial loss due to the other members violation of MasterCard or Visa rules. A refund or price adjustment provided from a previous purchase. A plastic card with a credit limit issued to an individual or organization, and used to purchase goods and services, as well as to obtain cash advances on credit. The cardholder is later billed by the issuer for repayment of the extended credit amount. A form that states a refund or price adjustment is to be credited to a cardholder account. Also known as a credit voucher or credit draft. The method of protecting information by encoding it into an unreadable format. The information is encrypted using a “key” that makes the data unreadable, and it is later decrypted, making the information readable again. Card Validation Code – MasterCard terminology for the three-digit code printed next to the card number in the signature panel. The code is used as part of the authorization process. Card Verification Value – Visa terminology for the three-digit code printed next to the card number in the signature panel. The code is used as part of the authorization process. The disarrangement of data so that only the intended users can read and understand the encrypted information. “Doing Business As” – This is the name a business uses to operate. A bank card that debits the cardholder’s personal checking account when used to purchase goods and services, or to obtain cash. For online debit transactions, the cardholder must enter a PIN. Also known as “Debit Network”, it is a portal that transmits debit data between gateway banks and debit card issuers. Only financial institutions may be members of debit switches. The card issuers denial of the use of a card for an attempted transaction. If a request for approval is declined, the merchant must ask the cardholder for an alternative form of payment. An authorization terminal that communicates with the authorization center via telephone. An encrypted attachment on an electronic message, that used for security purposes. Its most common use is to confirm that a user sending a message is in fact, who they claim to be. A way to encode a reply is also provided to the receiver. A term describing a merchant that primarily processes non-face-to-face or card-not-present transactions. Payment card transaction processing fees that are charged to the merchant, by the card acquirer. Electronic Commerce – The sale/purchase of goods or services via the Internet. Electronic Cash Register – A cash register that also acts as a point-of-sale terminal that processes credit card transactions. Electronic Draft Capture – The authorization and settling of credit card transactions through a point-of-sale device. Government benefits processed through electronic authorization, data capture and settlement procedures. Paper benefits and coupon distribution is eliminated with the use of plastic cards with magnetic stripes. The process where a paper check is converted into an electronic check at the point of sale. The check is then processed electronically through the ACH network. Moving funds through an electronic system. For example, a pay-by-phone transaction or an ATM withdrawal. The process of scrambling data in order to safeguard a cardholder’s personal information. Standards used to distinguish terminal types and components. A transaction that is not deposited in time to qualify for the best interchange rate. The date after which a bank card becomes invalid and should no longer be accepted. It is embossed on the front of the card. The action of a legitimate merchant processing transactions for another merchant in return for payment. This practice is prohibited by the associations. A protocol that is used to transfer files through a TCP/IP network (Internet, UNIX, etc). Any legitimate organization in the field of moving, investing or lending money, dealing in financial instruments, or offering any type of financial services. Types of financial institutions include commercial banks, thrifts, federal and state savings banks, savings and loan associations, and credit unions. A payment card created mainly for the fueling, maintenance and repairs of corporate owned vehicles. Fleet cards are generally used in order to provide specialized reporting. Also known as a post-auth, it is the method by which a voice-authorized transaction is key-entered in order to be settled electronically with a batch of transactions. The process of examining suspicious merchant or cardholder activity in order to identify fraud. The network provider that is in charge of authorizing and capturing transactions, as well as forwarding information to its back-end network. The portal that manages the electronic connection between consumers and their financial institutions, as well as transmits data. A plastic card that has stored-value; enabling merchants to have an electronic alternative to paper gift certificates. A card association member’s effort to resolve a dispute with another member in writing. A good-faith attempt to find a resolution must be made before filing a compliance case. A declined authorization due to a lost or stolen card, pick-up card, etc. In this case, the merchant should make a Code 10 call to the authorization center. A photograph that is laser-created in order to create a three-dimensional effect that is difficult to duplicate. It is used on many payment cards as a measure to battle counterfeiting. A system through which a transaction and authorization request is transmitted to and captured by the host computer at the front end, then sent back to the POS device. Because the information is already stored at the host, the transaction can be settled without the merchant performing a settlement function. An instrument used to imprint embossed card information onto a sales draft for payment card transactions. It is used when the card is present and the POS device cannot read the magnetic stripes contents. A digital phone service link that is able to support up to three types of communication devices at once. A Canadian national debit card network. The transfer of transaction data between issuing and acquiring institutions. Fees paid to the issuer by the acquirer in order to offset transaction-related costs. Interchange fee rates are established by MasterCard and Visa. A service provider that supplies access to the Internet. The Visa or MasterCard affiliated financial institution that holds contractual agreements with, and issues cards to, cardholders. Level I purchasing card data has the same information that is caught during a traditional credit card transaction. This includes the total amount purchased, date, merchant category code and the supplier or retailer name. Level II purchasing card data that has the same information caught at Level I, in addition to the following: amount of sales tax, customer’s accounting code, merchant tax ID number, applicable minority – and women-owned business status, as well as sales outlet ZIP code. Level III purchasing card data has the same information caught at Levels I and II, in addition the following: quantities, product codes, product descriptions, “ship to” ZIP, freight amount, duty amount, order/ticket number, unit of measure, extended item amount, discount indicator, discount amount, net/gross indicator, tax rate applied, tax type applied, debit or credit indicator and alternate tax identifier. The dollar amount of credit that a lender will administer to a borrower over a stated period of time. A service that processes payments by check, and credits the applicable business. The encoded numbers at the bottom of a check that can be used to authorize the check. The numbers include bank routing and transit information, checking account number, and check number. A strip located on the back of a payment card. It contains magnetically encoded cardholder account information. A point-of-sale device that reads a magnetic stripes encoded information when the card is passed through the reader. Readers may read Track Two, which contains the cardholder account number and expiration date, or Track Two as well as Track One, which contains the cardholder name. A member-owned international bankcard association that licenses members to issue cards or accept merchant drafts under the MasterCard Program. MasterCard owns and operates its own international processing network that is governed by a board of directors. A written contract between merchant and acquirer which details their respective rights, responsibilities and warranties. A universal four-digit merchant classification code that establishes the merchant by type of processing, authorization and settlement. Similar to a Standard Industrial Classification (SIC), but more specified. The fee an acquiring member charges a merchant to reimburse for providing deposit credit and handling credit card sales transactions. See also Discount Rate. The identification number appointed to a merchant by the acquirer. The method by which a merchant chooses to accept payment for their products or services. These include: MasterCard, Visa, American Express, Discover, Carte Blanche, Diners Club, JCB, Electronic Check and private label cards. A system of communication hardware and software that is used to transfer electronic information during the process of authorization and settlement. Any transaction during which a card is not present, such as a phone, mail or online purchase. See also Card-Not-Present. A lodging merchants charge to a cardholder account if said cardholder either fails to arrive or fails to cancel the guaranteed reservation. A debit transaction that takes place when a Visa/MasterCard check card is authorized through a credit card system and the dollar amount is debited from the cardholder’s associated checking (DDA) account. A transaction accepted through voice authorization and later keyed into a POS terminal before settlement. A confirmation number from the host computer validating a successful batch deposit. A transaction that is electronically authorized from a front-end network. An access number dialed to reach an external line. A numeric code used by a cardholder as verification to complete their transaction via a payment card. The number is entered into a keypad and is encrypted to be received along with the authorization. An issuer’s electronic reply to an authorization request, requesting that the card be held by the merchant and returned to the issuer. A one-time ACH debit from a consumer’s bank account used for purchases made in-person at the point-of-sale and upon receipt of a check and signed authorization. The location where a payment card transaction happens, usually through a credit card terminal or cash register. At the point of sale, a terminal connected via telecommunication lines to a central computer. Through the terminal, authorizations, recordings and transmissions of electronic transactions are performed. A credit or debit entry to effect an electronic funds transfer to or from a consumer’s bank account, that is initiated by a merchant and pursuant to a standing or one-time authorization from a consumer. The type of currency used when a purchase is authorized through Visa, MasterCard or American Express. A card that is issued by a merchant and can only be used in the issuing merchant’s business. For example, a department store credit card. Fees connected to the processing of credit card transactions. A company in charge of processing interchange transactions – operated by an acquirer or someone acting on the acquirer’s behalf. A set of rules that are followed in order to have data communications work seamlessly. Temporary memory for a computer or payment card terminal. A two-digit numerical code that identifies the reason a chargeback has been initiated. To petition an additional amount to be authorized on an existing transaction. A process used in the lodging industry when the original authorization is not enough to cover the current charges. A repeat transaction charged to a cardholder’s account periodically for recurring goods and services, such as a health club membership. It is processed with prior cardholder permission. A message received from an issuing bank when an authorization attempt requires a phone call to the Voice Authorization Center. A refund occurs when a merchant returns all, or a portion, of an original transaction dollar amount to a cardholder. Refunds are made to the same card that the original transaction was made on. A refund is similar to a credit. An effort to reverse a chargeback, initiated by a merchant or acquirer, to the issuing bank that presented the chargeback, with supporting documentation. A face-to-face transaction where a cardholder presents their card to the merchant in order to pay for goods or services provided. A request made by the issuer to the acquirer for a duplicate of the original sales ticket. When an acquirer re-presents a chargeback to the issuer, the chargeback is reversed and the the merchants funds are returned. The standard port on a Point-of-Sale (POS) device used to support a wireless transmission through VSAT, Frame, VPN or Motient. The port may also be used with several peripheral devices such as a check reader or personal computer. The dollar amount that a financial institution charges a merchant for each sales transaction made. Batches of transactions submitted to the acquirer by the merchant. In interchange, it is the process by which acquirers and issuers exchange financial data retrieved from sales transactions, cash advances, merchandise credits, etc. The currency in which a merchant collects funds after the successful completion of a foreign exchange conversion. A payment card that has a built-in microprocessor (chip) that holds information. Smart cards can be used for loyalty programs, stored-value cards, credit cards and security access. A “kit” built to help a developer combine software into another program or system. The ability of a card terminal to dial different telephone numbers in order to obtain an authorization or settlement of varying card types. A universal four-digit numerical code that identifies a merchant’s industry type. It is similar to an MCC code. A card used by a merchant to issue spending credit to their customers. The merchant’s customers are provided with a magnetic stripe card in exchange for money received, merchandise returned or other forms of payment. The card holds a dollar value that the merchant’s customer can either utilize or give to another individual. There is no security associated with this card. The actual record of the card balance is maintained on a stored value card database. A file that contains one or more transactions and is sent by the merchant . A correction made by the acquirer to a deposit when there is an error in the original deposit submitted. A method of communication that transmits continuously without stop-and-start bytes in between information bytes. Cards that are developed for, and used in, services related to travel. Any airline, lodging establishment, or car rental company that primarily provides travel-related services. A system in which transactions are stored in a terminal until the batch is settled to the host. It is most often used in situations where tip adjustments need to be made, such as in the restaurant industry. A set of numbers identifying a merchant to the front-end network. Any action made between a cardholder and a merchant, or member, that turns into activity on the cardholders account, such as a cash advance, a purchase, or a credit. The day, month, and year on which a transaction occurs. The dollar amount paid per transaction by a merchant for processing. The date embossed on a payment card, which states when the card may first be used. A third-party that approves their software to be used on a processor’s system. A member-owned national bankcard association that licenses members to issue cards and accept merchant drafts under the Visa Program. It is governed by a board of directors. A transaction that is authorized by a voice operator. Voice-approved transactions are “forced” into a terminal batch for settlement.